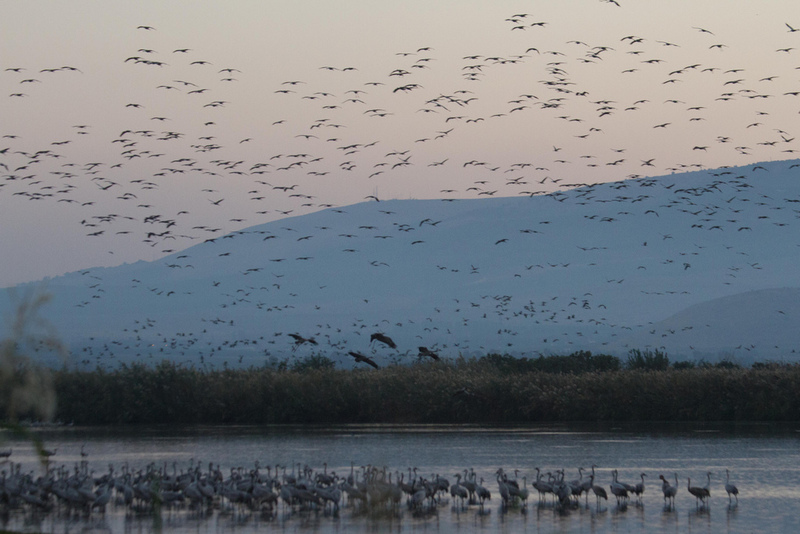 Our landlord Ron told us that one place we had to visit while here is the Hula Valley in the north of Israel, because it’s migration time for cranes and many other birds. Thank you Ron! We waited until Denise and Jim came and last Wednesday, we rented a car and drove north. On the way, we stopped at an archeological site of an ancient Jewish community, Korazim, overlooking the Sea (actually Lake) of Galilee. 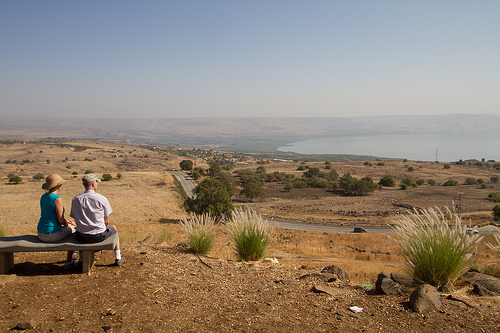 Here are Denise and Jim at an observation point with the lake below, just before we arrived at Korazim. It was possible to imagine ancient Jews and Jesus at the very same lookout point, one of the things I love about traveling around Israel. 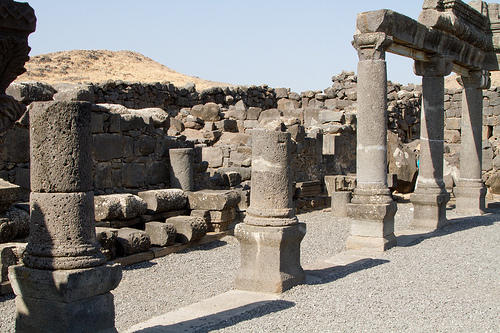 The town of Korazim began at least in in the time of the Second Temple and the New Testament mentions Jesus visiting Korazim. The ancient synagogue there, which was built at the end of the 4th century or the beginning of the 5th century, is considered to be one of the most beautiful discovered in Israel. 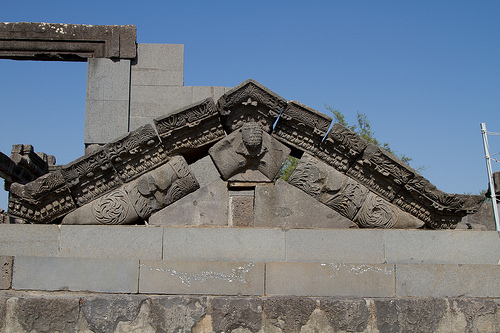 It is made of basalt and decorated with carvings of floral and faunal patterns, human figures pressing grapes and even lions, a difficult feat using extremely hard basalt. The only others there with us was a group of American Christians who were giving testimony and praying for healing in a moving demonstration of deep faith. 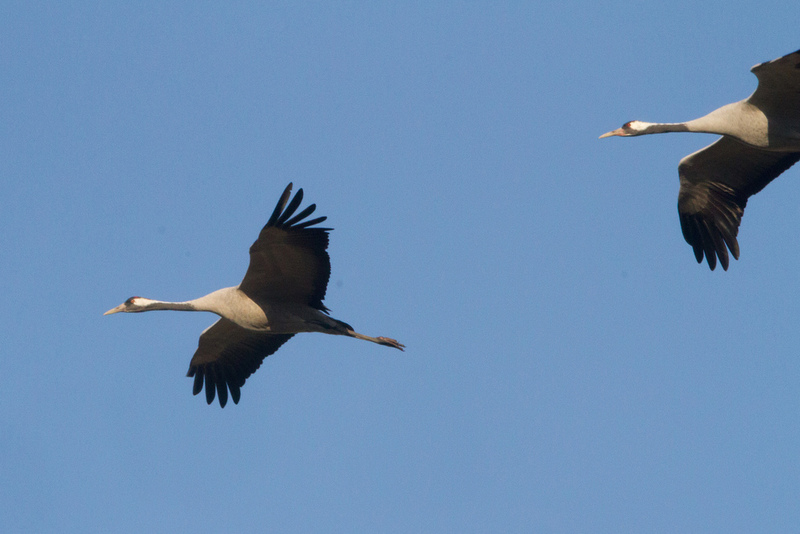 This was the season for the crane migration and it was truly an awesome experience to see and hear thousands of cranes flying, landing, and finding their mates. 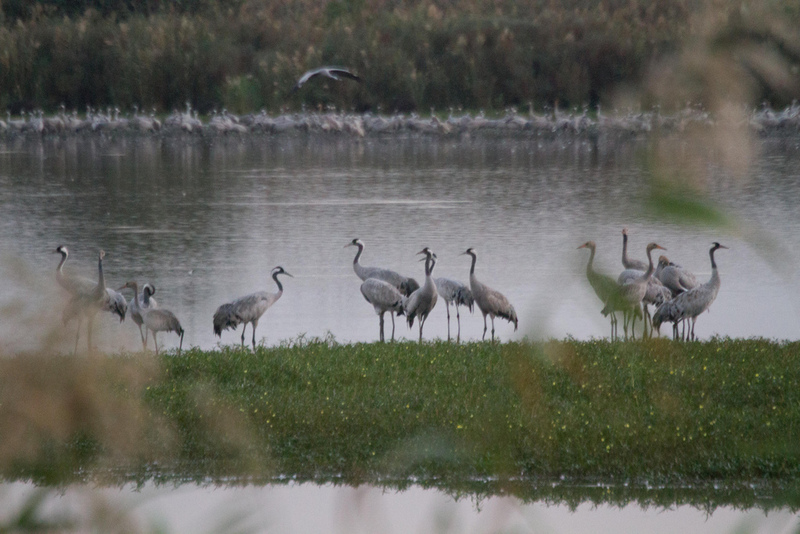 At times, the sky was nearly black with the cranes as we got close to sunset. Apparently the birds were destroying planted fields in the valley, so many governmental and NGO organizations joined together to put food for the birds in certain fields and to set noise cannons near the planted fields to keep the birds away. It appears to be working for the most part. Chuck took stunning pictures, a few of which I’ll put here. Don’t forget to click on them so they’ll enlarge, but if you want to see more of these, go to http://www.flickr.com/photos/sabachuck/sets/72157631972652687/ and click on the pictures themselves to also get Chuck’s explanations. One of the nature guides at the preserve told us the birds were so noisy because they mate for life and they find their mates in the masses of birds with their individual calls and voices. He also said at dark, they settle down and it’s very quiet, but unfortunately the park closes just before dark and we didn’t get to hear the quiet. We were all so glad we had come and I was delighted to see what a terrific job the Israelis have done with the nature preserve. 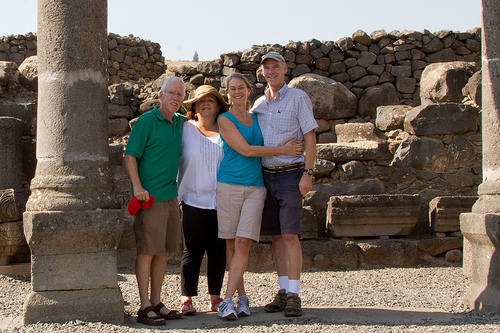 From the Negev desert to the Hula Valley we were awed by nature’s displays on this trip. As our grandson Ezra told us, God lives in Israel. Israel is a tiny country but the geography, climate and flora and fauna are as diverse as Israel’s people!